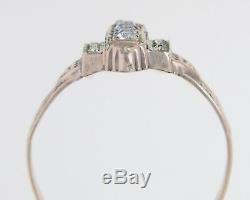 08ct Vintage Foil Back Diamond Cut Gemstone Ring. 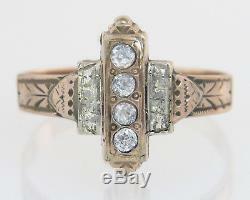 Featured for sale here is an estate antique Victorian 14K solid gold ring! 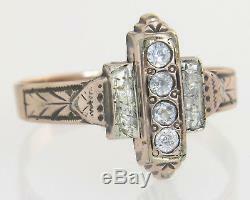 Outstanding classic Victorian detail and craftsmanship make up this genuine antique ring. 02ct vintage foil back gemstones that are cut with the same sparkle and shine as diamonds are set down the center. This piece is made from. 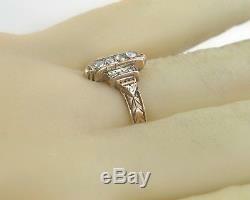 Solid 14K rose gold; hallmark has worn away after all these years which is natural! This ring still boasts the original patina that is a natural property of gold over time and is a sought after characteristic in antique Victorian pieces. 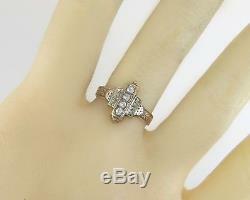 Measures 13 mm across in the center and sits 3.7 mm off the finger to the top of the gemstone. Victorian detail throughout make this a piece that will be treasured now and for generations to come! Beautifully crafted detail is the perfect mix of history and beauty! A must have for your jewelry collection! Thank you for shopping with us! We work hard to describe our items as accurately as we can. We attach large up close photos so you can make your own assessments. Condition, quality and grading of items varies by individual and these are our opinions. The gemstones and diamond in our pieces are all 100% natural unless we have stated they are not and label them lab created or simulated. The retail price we provide in only a tool to help you know the high price you could pay from a retailer. The approximate retail price we state is not an appraisal; we do not provide appraisal prices on the items we sell. You are the only person who can determine the worth of the piece. 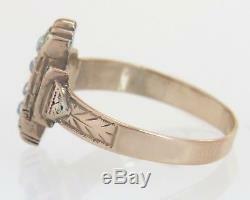 The item "Antique Estate 14K Rose Gold. 08ct Foil Back Diamond Cut Gemstone Victorian Ring" is in sale since Monday, May 1, 2017.